One of the most commonly prescribed classes of medicine for osteoporosis is one called Bisphosphonates. Since their introduction in the 1960’s, this class of medication has grown in popularity as well as controversy. Although seeming, still to some, like a “magic bullet” for osteoporosis, medical literature, and patient experience is proving otherwise. This class of medications is better known as Fosamax, Reclast, Boniva, Actonel, etc. Simply put, these medications inhibit the osteoclast (bone resorption) process and therefore increases bone mass. Since bones are in a constant state of remodeling, the osteoblasts (bone builders) are triggered to begin laying down new bone matrix when the osteoclasts (breaks down bone) have created small crevices in the bone that need to be filled with new bone. Remember, the breakdown of osteoclasts is in order to supply the body with minerals and allow for new strong, but flexible bone to be formed. In the case of this medication, the osteoclast, resorption function is inhibited, meaning the bone does not break down. At first glance, this might seem like a great thing. But in reality, it is very detrimental to the natural bone remodeling process. When bone is not resorbing (breaking down) then osteoblasts are not triggered. Therefore, no new flexible bone is deposited. The natural cycle of bone remodeling is halted and while some new bone mass does accumulate, the old bone hardens. This is a serious issue that should not be overlooked. Just because there is more bone mass present, does not inherently result in stronger bones with lower risk of fracture, especially after five years of use of the medications. These medications are known as bone builders, but in a letter to the Annals of Internal Medicine, Dr. Susan Ott wrote, “The evidence shows they are actually bone hardeners.” Dr. Ott also compares these medication treated bones to an old tree where “under the stress of a strong wind, younger trees are flexible enough to bend easily without breaking, however, older, dense trees, faced with a serious windstorm, are less able to bend and might snap in two.” This is the big deal. This is the problem. In Dr. Ott’s analogy, consider your femur, the strongest bone in your body to be the tree. There is well-documented evidence of the risk of the femur bone snapping in two with only the smallest amount of force. Take one example of a woman stepping off a train platform and collapsing only to find her femur bone not just cracked, but severed. In addition to increased risk of long bone fractures, there is a risk of jaw necrosis, which causes the bones in the jaw to essentially break into pieces causing facial deformations, life-long pain, and disfiguration. This is coupled with the increased risk of esophageal cancer and makes these medications something to be very wary of for short-term use, but most definitely for long-term use. The majority of the major fracture incidents associated with the use of bisphosphonates occurs after five years of use. Many women have been on these medications for decades since their initial advertisement in the 1970’s. The initial ad campaign caused women to flock to their doctors asking for Fosamax. Unfortunately, many women seeking the drug and doctors prescribing it have never looked back. 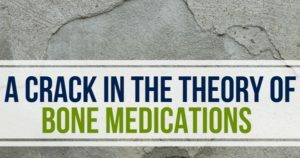 Despite these side effects being reported in research studies, case studies, and peer-reviewed literature, the medical community continues to offer these medications as first-line therapy. If you know us well at LifeWorks Integrative Health in Overland Park KS, we take some things from the FDA with a grain of salt when it comes to the alternative medicine approach to health. But when the FDA gives extra warning and begins to investigate the safety of a drug they let on the market, we pay attention. This is what happened with Fosamax as women began reporting severe pain associated with the drug with only short-term us. In fact, over $27 million dollars in lawsuits have been settled by Merck for adverse reactions to Fosamax for femur fractures, dead jaw syndrome (osteonecrosis of the jaw), esophagus problems, low blood calcium, and musculoskeletal pain. Of the over 4,000 cases, more than 1,200 were for osteonecrosis of the jaw. Supplementing appropriately for good bone health includes finding and correcting hormone and thyroid issues that will continue to antagonize good bone growth if not addressed. In addition, there are bone specific supplements that are very effective when part of a synergistic plan to give the bones all that it needs. Consider that bone remodeling is a matrix of many different elements which forms continually to keep new, bone mass occurring. The turnover of bone mass is about 200 days. This matrix is not only Calcium and Vitamin D, therefore only supplementing with these two popular options is not going to aid in a strong matrix for strong bones. Silica, Biotin, Vitamin C, Phosphorus, Vitamin K2, Magnesium, and Bone Morphogenetic Proteins should also be considered. Lifestyle Toxins: inflammatory foods, cosmetics, nicotine, alcohol, caffeine, prescription drugs, over-the-counter drugs, artificial food additives, colorings and preservatives, refined foods and sugars. Don’t just settle for a short-term fix for bone health. More bone mass that does not result in pliable, healthy, truly regenerative bone is not going to give you the strength and support needed for daily activities, much less an active lifestyle. At LifeWorks Integrative Health, we don’t just match a medication or supplement to your symptom. We work hard as part of your collaborative team to determine the underlying cause of your health issues. This means we never stop asking why. We are the alternative medicine Overland Park KS patients turn to and look forward to working alongside you to give you the health you need for the life you want.